Labret monroe facial piercing studs for the small diameter 16g piercing. 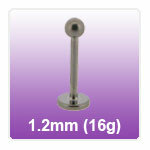 Available in a choice of lengths from 6mm to 12mm with steel and Titanium shafts. "Just received my first order from Jobananas today and I have to say I'm very impressed! My custom made barbell which I ordered for my rook piercing..."
"thank you yet again outstanding service as are your products , very happy with your service and extremely happy with your products as normal"
"arrived well before expected really pleased with my purchase lovey items just keep going back to them"